Joined are we in Bilskirnir by fair maidens. Are you already feeling better now? Yay, thank you! Hope you’re feeling better! Nice. Hope you’re feeling better. Fantastic stuff! Thank you very much (and be well, fotc)!! P.S. That Tooka. Last week she’s hiding under some guy’s bed, and this week she’s getting divorced again. Without me. Why do I long for her so? It must be the gymnastics. 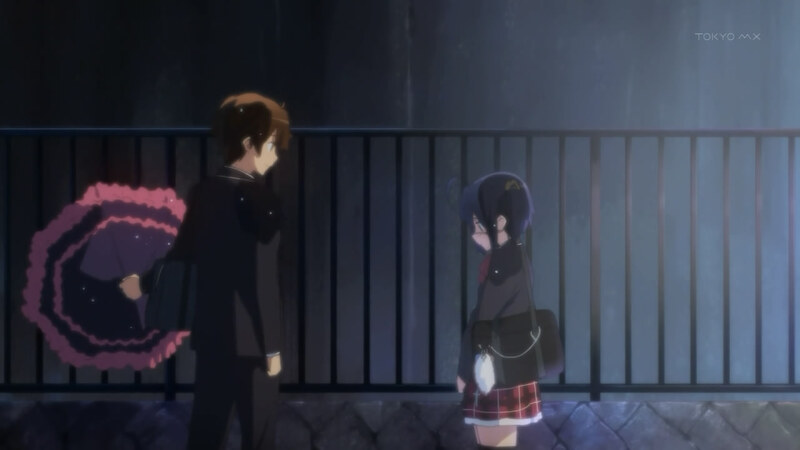 Oh gawd I love Rikka. Thanks for the subs URW! *Looks at date on post* Dec 6… What’s today? Dec 5…. There NEEDS to be a .gif from 5:54 to 5:57 that might have been the most epic combo hit ever. @ChronoBlue – I wonder if we’ll get to see a more detailed flashback of the confrontation. The brief clip looked pretty serious, especially for being so soon after their “new contract.” But there were witnessess, and he didn’t seem to be getting hated. Nor did Rikka leave town. I’m sure Dekomori’s reaction will be off the charts, though! This ep was awesome, thanks guys! Now we have to wait a whole week for the next one :/. Although I was expecting Yuuta to speak with her calmly and be supportive, not confronting her, you know? I think that aproach would have better results, seeing as her family never understood how she felt and treated her Chuunibyou as simple childish behaviour, and not her way of simply dealing with things. My neighbor wouldn’t like me using torrents on her network. Damn, all the women in Rikka’s family are hot.